Friday Faceoff: Who's Sandbagging Who? Home / Amy Henderson / Friday Faceoff: Who’s Sandbagging Who? Friday Faceoff: Who’s Sandbagging Who? 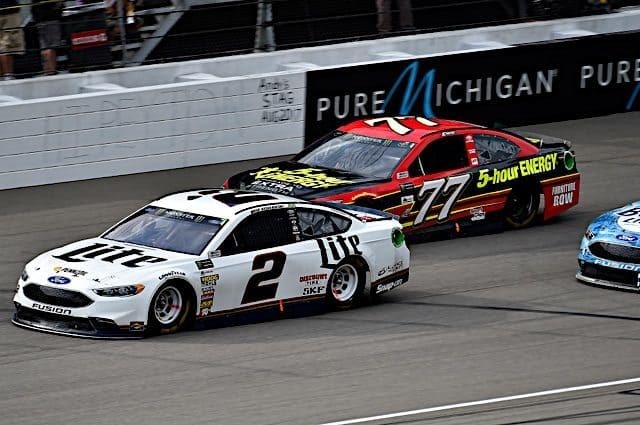 Last weekend at Michigan International Speedway, Brad Keselowski had some harsh words for the factory Toyota teams, accusing them of sandbagging after NASCAR floated the possibility of taking equipment from teams for comparison tests to avoid changes from the sanctioning body to increase parity. Is there any merit to Keselowski’s argument, and does it signal the beginning of a car wars situation similar to what the sport saw in the late 1990s? Amy Henderson: Is there merit to it? Sure. Sandbagging has been part of the game since the game began. I was surprised to see so many people dismiss the claim as outrageous, because it’s not all that wild. Kyle Busch said the Toyotas were testing a new motor package, which is also plausible. To the naked eye, it did look a bit strange that the cars that had been dominant all year suddenly weren’t so dominant, so new package or something else, it wasn’t something that went unnoticed. As for car wars, I hope not. While I’d like to see more room for teams to work on cars, I was never a fan of the teams’ whining or the subsequent concessions by NASCAR every other week. Michael Massie: There is a lot of merit to Brad Keselowski‘s argument. For most of the season, it has appeared that the Joe Gibbs Racing and Furniture Row Racing Toyotas could lap the field on seven cylinders. NASCAR floated the rumor, and all of a sudden, the Toyotas were not quite as dominant at Michigan. The FRR cars were still fast, but it was Keselowski’s Ford that led more than half the race. JGR went into hiding for the entirety of the weekend. I love this edition of Car Wars: Toyota Strikes Back. It is the only entertaining rivalry going on in the sport right now. I can’t wait for its sequel in a few years, Car Wars: Return of the Dodge. Vito Pugliese: Absolutely there is merit to his argument. Look at the performance of the Toyotas at any of the intermediate or downforce tracks of the past month. Busch and Martin Truex Jr. dominated Pocono Raceway and Indianapolis Motor Speedway before their late-race accident. Then suddenly at another low-banked, high-horsepower track, they’re average? Please. If the call was to take cars after the race and Toyota tuned things down a bit, either in the engine department or in the suspension or body, what would be the point in taking the cars for evaluation? Let’s see how things work out at Darlington Raceway, since the Southern 500 is a marquee race that they’re not likely to lay down for and a place where traction and downforce are king. This week, NASCAR heads to Bristol Motor Speedway. Two of the series’ best drivers at the track, Matt Kenseth and Joey Logano, are looking for wins to lock down a playoff spot. Which of the two is most likely to get that all-important win, or will both be out of luck in Thunder Valley? Massie: Both drivers have been extremely good at Bristol in recent memory, but Matt Kenseth is the one that is more likely to get the win. He drives a Toyota, so he has one of the best six cars in the garage every weekend. Also, Kenseth has been competing for wins of late, and you can’t say that about the No. 22 bunch. Joey Logano‘s team has showed zero speed of late, and that won’t suddenly reverse itself in one weekend. Pugliese: Kenseth. It’s always a good track for him, and he doesn’t seem to have the same sense of desperation – or depression – that Logano has exhibited in his post-race interviews the past few weeks. His biggest obstacle will be teammate Busch, who after winning the Truck Series race on Wednesday looks to be in weekend sweep mode again at Thunder Valley. Henderson: Kenseth; his driver rating at Bristol shows his sustained excellence there, and he’s in a Toyota, which is an advantage. Don’t count Logano out by any stretch; he’s been the best driver in terms of points earned on the short tracks this year, but he’s in desperation mode now, and that doesn’t tend to work out too well. Bristol is hard to pick a clear favorite recently, they have as good a chance as anyone of winning. Kevin Harvick said last week on his radio show that Dale Earnhardt Jr. may have hurt NASCAR’s growth in his position as the sport’s most popular driver because he wasn’t winning championships or as many races as some others. Is Harvick right? Pugliese: Unequivocally false, for a number of reasons. Dale Earnhardt Jr. was winning races and contending for championships during the early- to mid-2000s when NASCAR’s reach was unstoppable, back when everyone predicted the death of NASCAR following his father’s passing. The recession which began in 2007 and came to a head at the end of 2008, coupled with the advent of the COT, are the actual culprits. This is a sport that operates on other people’s money. By its very definition and reliance upon sponsorship, wading into the worst recession in 50 years meant the loss of sponsorship dollars, marketing avenues and perhaps most importantly, manufacturer support. Fans didn’t have disposable income to spend, and the product on the track wasn’t exactly something to throw your wallet at either. Perhaps it did have some effect from some of his father’s fans who were hoping his son would compete into his 50s like his dad have left, but he’s not the reason grandstands were being removed from intermediate tracks on the circuit. Henderson: No. It makes no sense; Earnhardt has a zillion fans, and they’re intensely loyal. Kevin Harvick’s comments were an insult to Earnhardt fans who have stuck with him through some lean years. The most popular driver and the winningest driver don’t have to be the same person for the sport to be relevant. The fans left when NASCAR threw gimmick after gimmick at it in hopes something would stick and make the big fad last forever. It didn’t, and that’s totally not any one driver’s fault. It’s not on Earnhardt or anyone else to save the sport, it’s on NASCAR. Massie: When Earnhardt’s career started, the majority of NASCAR’s fanbase was in the Southeastern United States. Had there been another driver from the Southeast during Earnhardt’s career that had been winning championships instead of him, then everything would have been fine. Instead, the champions were from California, Indiana, Wisconsin, Michigan and Nevada; the majority of NASCAR fans could not relate to these guys. Bill Elliott is the only driver to have won the Most Popular Driver award more than Earnhardt. He also did not win multiple titles and went on a long winless drought. Fans did not leave because there were still Southeasterners that they could relate to winning titles, such as Dale Earnhardt, Dale Jarrett and the Labonte Brothers (I am including Texas in this demographic). Having these characters helped fans get through the Elliott slump. It also helped that NASCAR was not completely in love with the clean air advantage at that point in time. According to reports, NASCAR is considering using a hydraulic jacking system, which would eliminate the need for a jackman on pit road. Thoughts? Henderson: Terrible idea. One of the reasons fans have left the sport is that it’s less relatable than it used to be—the cars are a poor attempt at anything remotely stock-looking, the drivers are more corporate and less accessible to fans, the television broadcasts are narrow-minded and boring. The crewmen are an exception; they still give the impression, at least, of being regular Joes doing a tough job and doing it well. Take that human element away even just a bit, and it takes something from the appeal of the sport, which NASCAR can’t really afford to do. The cost savings here is negligible (and what happens if an air jack fails? Teams still need someone to jack the car up and would likely be penalized for too many men over the wall if that were the case), and it would do nothing to improve the racing, so there’s no need to make a change. Massie: Just another thing that fans will not be able to relate to and further separate the cars from being the stock cars available to the public. Also, I’ve seen how big some of those jackmen are on pit road. The NASCAR executives should know better than to piss them off. Pugliese: I understand the need to cut costs, but this seems a bit frivolous. Now teams have to engineer cars to accept the jack, buy the jack and hope said jack doesn’t fail. It also opens up another avenue for teams to try to exploit and cheat the rules. It would be like the NBA saying it needs to save money on player salaries, so it doesn’t need centers anymore. With driver salaries taking hits in the millions, a team saving $50,000 a year on a jackman seems pretty trivial and removes one of the defining aspects of NASCAR racing vs. other series. It’s also just another unnecessary item for critics to pan, pick apart and exploit as a reason why they no longer want to watch and hate that NASCAR is constantly tinkering with one of the few things the last 10 years has worked as expected: the race on and off of pit road. Next 4 Burning Questions: Will Kyle Busch Pull Off Bristol Sweep Again? kb is frustrated living without a package. So sad. So desperate. So pathetic. And living without a brain as well is the only thing that makes life tolerable for him. Sand bagging does not occur during a race. It occurs during practice and qualifying. You don’t want to cause any suspicion of foul play by showing your hand before the race when they can do something about it. Brian France said that any driver not giving 100% would be penalized. There has not been one driver prenalized since he said that so they can’t be sand bagging or stroking it. Besides do you really believe Kyle Busch could ever drive slower during a race? Because there are so many drivers, Kyle and Kurt Busch, Lugano, Harvick, Kesslowski, Truex, Bowyer and others, that want to lead every lap of every race that you have to run hard to keep up. However this does not hold true at Talladega and Daytona as some do lay back to avoid the big one. This is not sand bagging it’s being cautious. Dale Jr. Has been good for the sport. Period. Attendence and tv ratings were not affected by his absence from races last year. They were sinking before he withdrew and are still sinking since his return. Most people are race fans first and then have a favorite driver. Nothing will change when he doesn’t race next year. His father was a different story. I personally know people who stopped watching races after he passed away. Being the most popular today is not like being the most popular in 2000. The fan base is less then half of what it used to be. From a safety stand point auto jacks could be a good thing. The jack man is the most volnerable crew man out there. As a cost saver it doesn’t amount to anything. They’ll just spend the savings elswhere. Al, you are correct in your comments about sandbagging. Before “winning practice” became some kind of priority for some teams, sandbagging in practice was common. No reason to show your hand before you have to. Sandbagging during a race does not happen, especially among the Toyota camp where every driver wants to be Top Dog every lap of every race from Kyle Busch to Erik Jones and wrecking a teammate to win is perfectly acceptable. As for Dale and his father, I stand by my assessment that NASCAR chose, especially with Junior, to center their entire marketing strategy around him and they have only themselves to blame for that error and the multitude of other errors they have made over the last 15 years. Dale Sr. was never universally loved or even respected until he became Dead Saint Dale and any fan who left the sport because he died was never a racing fan to begin with. One man does not make a sport, especially a man as flawed and dirty as he was. Moron kb, read the post! Al Torney clearly wrote that Dega and Daytona are the exceptions to the sandbagging rule. And that wasn’t even sandbagging, it was playing the points, a different animal entirely. You could not be any more stupid if you actually tried! Amy believes Brad. What a shock! She also believes in the Easter Bunny, the Tooth Fairy and her beloved Underdogs (who should not be racing at the top level in any case). Funny that one week Kyle Busch is roundly criticized for pitching a fit at finishing second and a few weeks later he is accused of throwing a race. I guess when bias and hatred rule your pea-brain, Amy, anything is possible! What is NEVER believable is anything that comes out of Amy’s keyboard. As for Dale Junior, he is not personally at fault for destroying NASCAR. But NASCAR’s marketing decision to put all their eggs in the JOOONYER basket leaves them with another self-inflicted wound. No other sport pimps its non-performers like NASCAR. Earnhardt has not been relevant for nearly a decade, but the hype machine never stops. Considering that NASCAR is more about marketing than competition, one would think they would be better at it. But no, it is all Earnhardt all the time ad nauseum. Last year when it was apparent Junior was done for the year, NASACR’s own website continued to hype him in their faux Power Rankings. NASCAR is run by idiots for idiots and the media whores will write any BS to keep their NASCAR press credentials, but every last one of you knows you could never make it in any type of real journalism. If you want to talk sandbagging, look no further than J-Jo! All season long. You know it, that is the normal Modus Operandi!!!!!!! But I do believe the Toys are playing a game they always play too! Maybe they put a block under the right pedal so it won’t reach the metal! Yup. Jimmie will miraculously come out of his slump right around Chicago. Surprised that we haven’t seen an article up yet from the media questioning what’s wrong with Jimmie and how this could be the end of his reign. Of course Brad was correct! But, but, but…The mouthpiece for Brian France said it was not true..NO SANDBAGGING!!!! So, I guess we are to believe one of The Emperor With No Clothes on YES MEN! Got it!!!!!!!! Toys love playing games, they are not to be trusted, but hey as long as Brian’s checks keep coming and clearing..he will believe Toyota and Jesus Joe if they told him the moon was made of Swiss cheese! Such envy. So pathetic. Such a tiny little pecker.